I was on a road trip yesterday listening to Christmas music and ‘Believe’, sung by Josh Groban, came up. His melodic tenor voice singing this inspirational song captured my attention. I have quoted the refrain, my favourite verse, and the core message of the song. Part of The Polar Express soundtrack (2004), ‘Believe’ celebrates the magic Christmas offers to both adults and children. If you’re in the mood, I recommend the YouTube video sung by Josh Groban, accompanied by beautiful images, uploaded by Chrmdanglgrl. If you click on ‘Show More’ under the video, you will be able to read the full lyrics while listening to the song. For more seasonal and uplifting quotes, please visit SilverThreading, host of Writer’s Quote Wednesday, and RonovanWrites, host of Be Writing on Wednesday. And how can I consider what’s wrong and what’s right? When everything moves even faster than light? Make you want to run. This post was written in response to Ronovan Writes Monday Haiku Challenge #65. 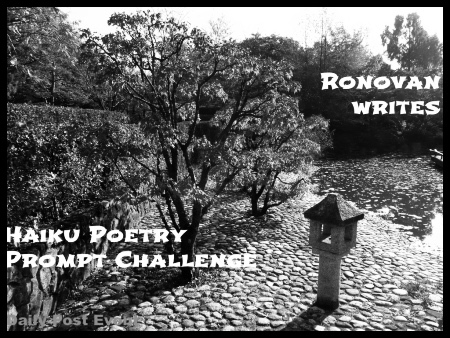 To read more haiku using the prompt words “Harp” and “Clear”, please visit Ronovan’s Prompt Post. There he explains how to participate; participants post links to their haiku contributions in the Comments section. On Sunday, October 11, visit RonovanWrites for a Roundup with links to all entries, plus an informative and entertaining review. But if we continue there’ll only be emptiness. My quotes for today are from ‘Love Song to the Earth’, a charity single released on September 4, 2015. The first section is the song’s refrain and the second is one of the verses. The song was written by a group of writers at the request of the United Nations Foundation. There are a variety of authorship attributions, but these names have been cited most often: Tony Gad, John Shanks, Natasha Bedingfeld, and Sean Paul. ‘Love Song to the Earth’ is an anthem intended to increase public awareness and support for climate action as we approach the UN climate talks in Paris (November 30 to December 11). The idea is that general public support for climate action will motivate world leaders at the climate talks to reach a bold consensus. The first time I listened to the song I thought it was sort of ‘soft’. It is gentle, but I have come to like it. I quoted the rap verse, because I feel that musically, it has the most ‘punch’–as do the words. The gentleness of the song was intentional. People tune out to climate change fear messages. The writers felt that appealing to feelings of love and a desire to care for our planet would be more empowering than trying to motivate with fear. I tend to agree. What are your thoughts on this? The message, with signatures, will be presented at the opening of the climate talks. On top of all this, any royalties from purchasing, streaming, or sharing the song will go to the United Nations Foundation in its work to promote international climate change efforts, and to Friends of the Earth U.S., for its climate change work. 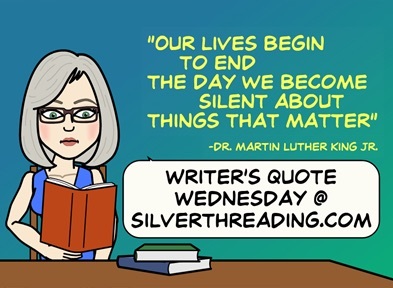 This post is being linked to Writer’s Quote Wednesday October 7 hosted by Colleen Chesebro, author of Silver Threading. Please follow the above link to read her launch post. As well, there are links to other Writer’s Quote Wednesday posts in the Comments section. And for more quotation posts, visit Ronovan Writes #BeWoW, October 7. 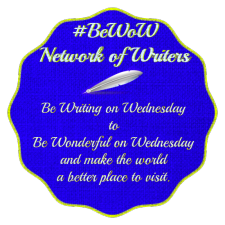 This link will take you to a post by Ronovan, host of #BeWoW– Be Writing on Wednesday and Be Wonderful on Wednesday. Day 2 of WordPress Blogging University, Writing 201, and the assignment is to write an Acrostic poem. Hint: in my poem the first letter of each line will spell out a word. 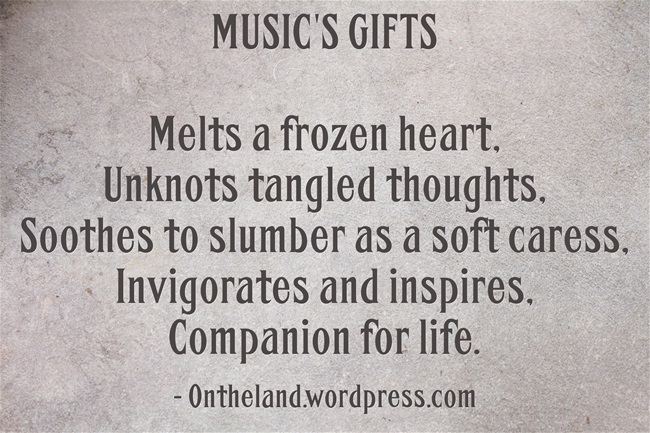 Music is an art that is close to my heart–in fact, there was a time when it was an obsession. I played oboe and then saxophone–stories that have been buried inside me for a while. Blogging seems to loosen the compacted earth of memory, as a garden hoe–an unexpected process, but not an unwelcome one. The idea that there is always a crack of light or sliver of possibility; that change is possible, even when it is hard to imagine, is very encouraging. 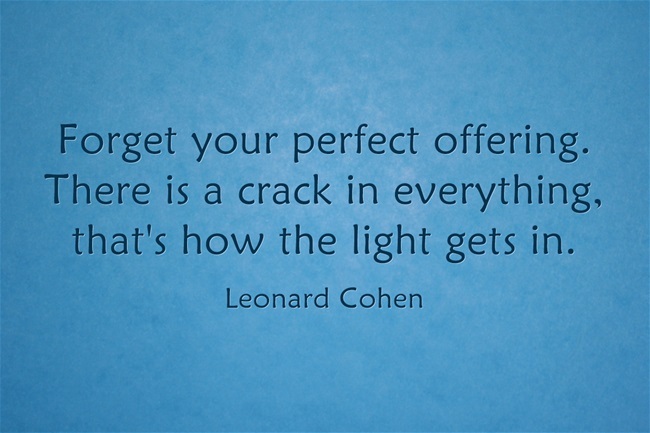 There is probably more than one meaning to ‘Forget your perfect offering’ in the context of the full song, but I like to take this phrase at face value, as an invitation to write, despite awareness or fear of imperfection. I smiled to myself when I learned that Leonard Cohen perfected this song over a 10-year period before he finally performed it. The YouTube video below was recorded live in London, in 2008. I chose this performance as it is the one that I have on my phone. 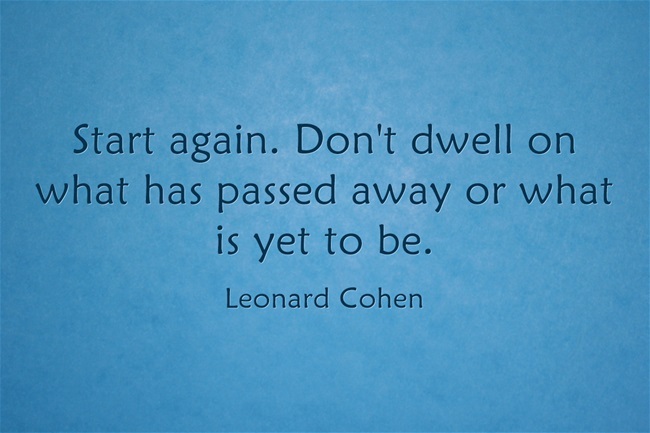 Leonard Cohen was born in Montreal, Canada in 1934. He was a published poet and novelist before his debut as a musician in 1967, at the Newport Folk Festival. This post is being linked to Writer’s Quote Wednesday September 30 hosted by Colleen Chesebro, author of Silver Threading. Please follow the above link to read her launch post. As well, there are links to other Writer’s Quote Wednesday posts in the Comments section. For more quotation posts, visit Ronovan Writes #BeWoW, Sept 30. This link will take you to a ‘must read’ Wednesday post by Ronovan, host of #BeWoW– Be Writing on Wednesday and Be Wonderful on Wednesday. In this neck of the woods, life speeds up in September. Vacations and summer camps come to an end, children return to school, and the work pace quickens with the launch of new initiatives. In a recent post, It’s About Pacing Yourself, I describe how I was cautioned to pace myself when starting off in the workforce; and I share the advice of productivity consultant, Laura Stack. I’m in a Hurry was written by Roger Murrah and Randy Van Warmer,and was released as an Alabama single on September 1, 1992. Alabama, one of the world’s best-selling bands, first emerged in 1977 and is currently touring. It’s music has been described as American Country, Southern Rock, and Bluegrass.